So, I have heard you are a sysadmin and want to setup your Apache Tomcat with a free SSL certificate from Let’s Encrypt — the free, automated, and open Certificate Authority (CA). Glad you are here! It is actually much simpler than purchasing a SSL/TLS from a regular CA. Yes, you can be one of them. Let’s Encrypt is here to stay. This guide assumes you have a host named foo.example.com running some flavour of Linux. We stick to Ubuntu 16.04.4 LTS, but any other will suffice. You are the sysadmin, they should all be the same to you. Make sure the ports 80 (http) and 443 (https) are open to the world. You need correct DNS settings. Let’s Encrypt authenticates your host with Domain Validation. You won’t get a SSL certificate from Let’s Encrypt if foo.example.com does not resolve to your host. Make sure your A Record resolves foo.example.com. You also need Apache Tomcat 8.5.x. I really doubt it works with any version less than 8.5. Haven’t tried. Be my guest. First you need to install certbot. A small tool that creates keys, signs and downloads Let’s Encrypt certificates to your host. Yes, the certbot does all of the above. Forget the CSR uploading and signing ceremony you have been doing in the past. And leave the credit card in your pocket. It is not needed, anymore, ever. We continue working as root. Next we create the SSL certificate for foo.example.com. Boom! Congrats, you are done. Yes, that is all you have to do. It Doesn’t Get Any Easier. These are all the files you need. I won’t go into detail about how to install Apache Tomcat 8.5.x. Many Linux distributions already come with prebuild packages. In theory, there is some apt install tomcat waiting for you. Just make sure you install Apache Tomcat 8.5.x. Let us assume your Apache Tomcat installation directory is /opt/tomcat. Connoisseurs call it CATALINA_BASE. Next copy the files cert.pem, chain.pem and privkey.pem to CATALINA_BASE/conf. Any other directory works, too. Even symlinks work, provided the permissions are set properly. Just make sure not to move the pem-files! Only copy them. Don’t forget to set the permissions. The last step is to edit server.xml and configure the HTTPS connector. Fire up your favorite editor (should be vim) and scroll through the file until you find the HTTPS connector tag. This section is commented by default. Syntax highlighting is your friend. Excuse my non-existent photoshop skills. Unfortunately I do not own foo.example.com. Yes, unfortunately, or luckily - depending who you ask - SSL certificates provided by Let’s Encrypt expire after 90 days, unless you refresh them. Refreshing is easy. First shutdown Apache Tomcat. Now copy the new generated pem files back to your conf directory. Start Apache Tomcat and you are done. It is really easy to setup Apache Tomcat with SSL/TLS certificates from Let’s Encrypt if you are using certbot from EEF. Encrypt the web: Install HTTPS everywhere today. Do I need openssl and this strange APR connector? You can use openSSL and APR but it is not required. 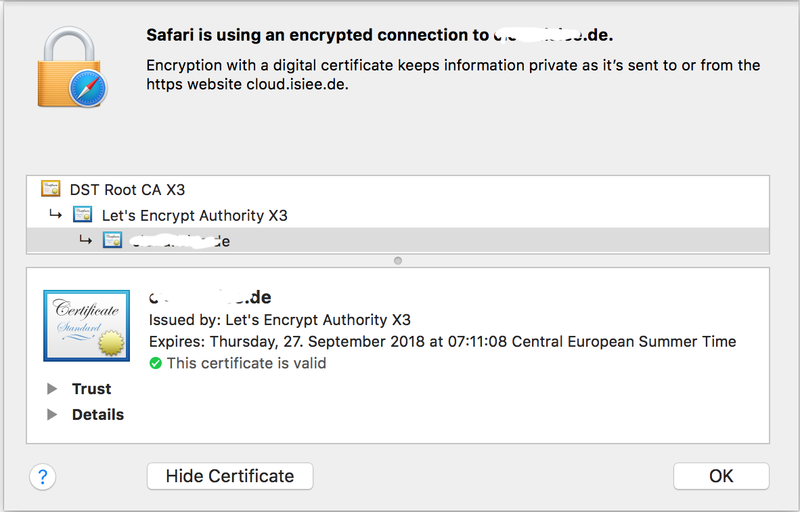 Does Let’s Encrypt provide EV SSL certificates? No. Only domain validation certificates are supported. I am running Apache Tomcat behind Apache HTTPD. This guide covers only Apache Tomcat running standalone. What is the difference between Let’s Encrypt and certbot? Let’s Encrypt is a service provided by the Internet Security Research Group (ISRG). Certboot is a program written by the Electronic Frontier Foundation (EFF).